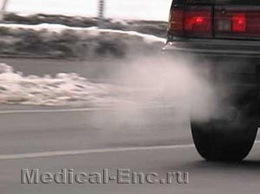 Exhaust - gas mixture produced by the combustion of fuel in internal combustion engines. The exhaust gases include carbon monoxide, carbon dioxide, hydrocarbons, oxygen, hydrogen, nitrogen, aldehydes, nitrogen oxides, sulphur, using leaded gasoline - lead. The toxicity of exhaust gases is determined by the carbon monoxide, the number of which in the exhaust gases can be 11.6% and more of the gas mixture. Poisoning by exhaust gases can occur in workers garages, petrol stations, car repair shops, drivers and traffic controllers transport. The clinical picture of poisoning by exhaust gases and first aid - see Monoxide.